Pneumonia is a serious inflammation of the lungs that can be caused by a wide variety of bacteria, viruses, fungi, mycoplasmas, parasites and other organisms, as well as by a severe allergic response to various substances. 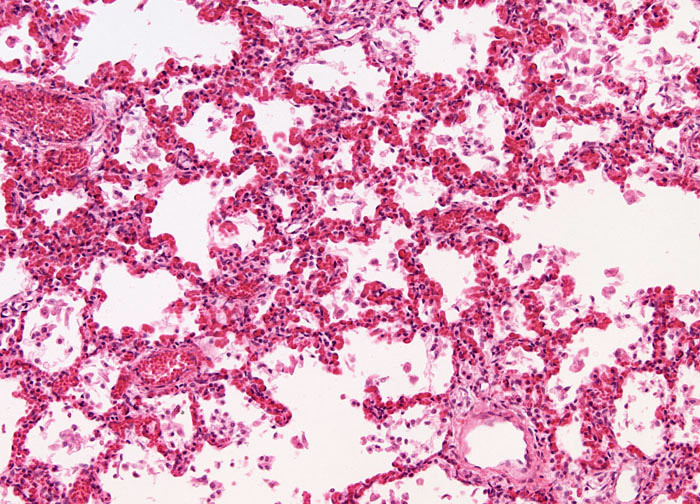 Generally the infecting organism is inhaled directly into the lungs, but in some cases it may arrive at the lungs via the blood or from an infection of nearby tissues. In response to the foreign material, the tissues of the lungs become inflamed and produce fluid (exudate) and pus, which causes congestion. The normal functioning of the lungs is hindered by congestion so that most individuals with pneumonia experience shortness of breath, increased sputum production, and a chronic cough. Other symptoms of the illness that frequently appear include headache, muscle aches, fever, fatigue, joint stiffness, loss of appetite, sore throat, chills, and sweating.